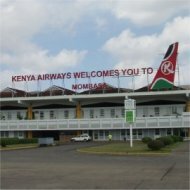 Compare prices of all airlines that offer flights to Kenya on this page. Also see my other pages about air connections to Kenya from various parts of the globe and tips how to get the cheapest tickets to Kenya. One tip is to always compare, compare and compare some more! The cheapest ticket prices are quoted below, but the actual price depends a lot on the date and time you fly, and how far in advance you’re booking. So asking the airlines below for a quote, and checking alternative dates and routes takes some time, but it may save you hundreds or even thousands of dollars. Kayak.com brings the cheapest flights back from 140+ travel sites in seconds. All major travel networks like Expedia, Travelocity and Orbitz are included in the search results. Vayama.com is also able to find of a lot of Kenya flights. This search engine searches 100+ airline sites for cheap deals and is especially geared to travelers from or to the USA or Western Europe. Please note there are no direct flights to Kenya from the USA, Canada or Australia – you’ll have to fly via an international hub (typically Europe for Americans and Canadians - and southern Africa, Asia or the Middle East for Australians). Sometimes, it pays off to book separate flights with different airlines in that case. All international flights to Nairobi (except a few from Kenya’s neighbours) come in through Jomo Kenyatta Airport (code: NBO). Kenya Airways: Besides many African destinations, Kenya Airways (a quality airline owned partly by Dutch KLM) offers flights to Kenya from London (daily flights), Amsterdam (7 flights a week), Paris (3 flights a week), Dubai (7 flights a week), Mumbai (7 flights a week), Bangkok (3 flights a week), Guangzhou (4 flights a week), and Hongkong (3 flights a week). KLM: This Dutch airline has two daily flights from it’s hub Amsterdam (Schiphol Airport) to Nairobi and Mombasa. Return tickets start from EUR 800. Amsterdam is a major hub for flights from the USA and Canada. 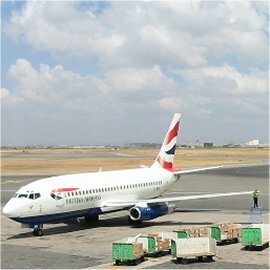 British Airways: Operates flights from London Heathrow to Nairobi. Round trips start from GBP 550 (USD 1100). Like Amsterdam, London is a major hub for flights from North America. Virgin Atlantic: started daily services from London (Heathrow) to Nairobi in mid 2007. Return tickets start from GBP 450 (USD 900) already. Swiss International Air Lines: operates several flights a week from Zurich (Switzerland) to Nairobi with return tickets starting from CHF 1650 (USD 1650). Brussels Airlines: (former Sabena/SN) has 3 flights a week from Brussels to Nairobi. Return tickets start around EUR 800. Qatar Airways: has one flight each day from it’s hub, Doha (Quatar) to Nairobi. Return fares start around USD 750. South African Airlines: operates one daily flight from it’s hub Johannesburg to Nairobi. Many travelers from Australia use this route. Return fares are from USD 550. Emirates Airlines: has 11 flights per week from it’s hub in Dubai (United Arab Emirates) to Nairobi with return tickets around USD 750. Egypt Air: operates 5 flights per week from its hub Cairo to Nairobi with round trips starting from USD 550. Ethiopian Airlines: offers one daily flight from the Ethiopian capital Addis Ababa to Nairobi with return tickets starting from USD 500. Airlines that were at one time offering flights to Kenya, but have meanwhile discontinued them, include Lufthansa, El Al, Gulf Air, Pakistan International Airlines and Olympic Airlines. Additionally, Uganda Airlines is out of business since some years. Please note that the information on this page changes often. I appreciate your feedback to keep this page as current and accurate as possible!